FREE 5 YEAR/100K ADDITIONAL MILE WARRANTY, GOOD AT ANY REPAIR FACILITY NATIONWIDE! SEE MORE PHOTOS OF THIS VETTE AND 125+ OTHERS FOR SALE AT WWW.BUYAVETTE.NET! Light Medici Red exterior with Cream coves, Cream interior, Cream convertible top. 300hp LT1 engine, 6 speed manual transmission, posi rear-end. Love the way the straight axle Corvettes look but hate the way they drive? If that's the case, then someone has already built your perfect car for you! 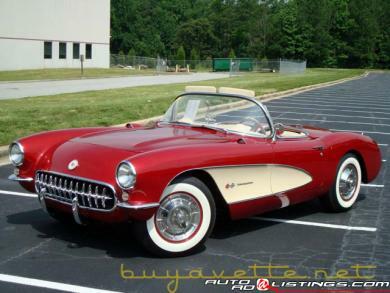 Commissioned by Jamison's Custom Corvette, Inc. in Charleston, South Carolina, this 1957 Corvette combines the classic looks of the first generation with the modern drivetrain and underpinnings of more recent Corvettes. This all-new tube chassis incorporates C4 suspension with a HAL coil-over shock conversion, C4 brakes, and power rack and pinion steering. The result is one of the smoothest riding, best handling straight axle restomods ever built! Not to mention that at an estimated 2,800 lbs, this Corvette packs a pretty hefty punch when the hammer is put down. Completed in 2003, no expense was spared in the build of this car, and only 4,674 miles have been logged since then. This car is so unique that it was featured in the February 2003 issue of Vette Vues magazine -- see our pictures at http://www.buyavette.net/1855C%201957%20Corvette%20LT1%20Restomod%20Convertible.php for this article. Every nut and bolt is new, and the body is as straight as an arrow. The convertible top is constructed of a thick canvas material, and is much stronger than the original tops. The Cadillac-sourced paint is nothing short of jaw-dropping, with a brilliant mile deep shine and no apparent imperfections. This is some of the finest paint and prep work we have ever seen on any vehicle, much less a Corvette -- we estimate the builder's body shop bill to have been around $50,000. Every piece of chrome has been redone, and the whitewalls and original style hubcaps add a nice classic touch. The interior of this 1957 Corvette Restomod shows plush leather seats finished in Cadillac colors again, and thick cut-pile carpeting. All gauges have been replaced with VDO units for increased accuracy and reliability. The air conditioning in this car blows hard and cold! A Sony cassette stereo has been added, and links to a 10 disc CD changer mounted in the trunk. The battery has also been relocated to the trunk to help with weight distribution. The LT1 engine looks right at home in this super-clean engine bay, and sports a set of coated longtube headers with Edelbrock mufflers for a throaty yet subdued classic sound. A reproduction 1957 owner's manual is included, with an added addendum at the back giving part numbers and color codes specifically for this car. We cannot stress enough how smooth this car drives, stops, and handles -- you would swear you're driving a modern Corvette! This truly is one of the finest straight axles on the market today! Features include air conditioning, power steering, power brakes, power antenna, Sony cassette stereo with CD changer. The seller of this car wants to quickly raise some capital, and has drastically reduced the price of this car! FREE 5 YEAR/100K ADDITIONAL MILE WARRANTY, GOOD AT ANY REPAIR FACILITY NATIONWIDE! Our Price: REDUCED!! $105,000. Financing Available.